Hey everybody! We’re getting back to our “Meet the Team” series here at Soul! Today we’d like to introduce you to our fifth barista, Emma Claire Glassie. Emma Claire came on board with us a little over a year ago. 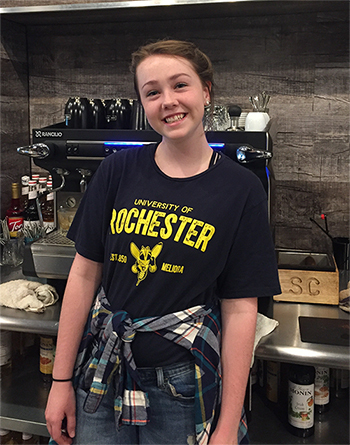 Even though it was her first coffee shop work experience, Emma Claire quickly became a top notch barista with a true gift for creating fantastic drinks. Name a girl scout cookie you like, and she can make you a drink that tastes like it. (Her Samoa latte is to die for! My personal fave!) She has a great attention to detail and is awesome with customers. We love how quickly she gets to know people and easily remembers names and drink orders of even not-so-regulars. EC is a recent high school graduate and will be beginning studies at Rochester University in upstate New York this fall. She’ll be studying biomedical engineering and medicine. We are so sad to lose her, but we’re so happy for her as she starts this next exciting chapter. Thanks EC! We love you and we’ll miss you this fall!